1st Squad, 2nd Platoon, Baker Co, 1st Battalion, 7th Marines goes on patrol in Sangin’s “green zone,” the agricultral area near the Helmand River. The security patrol was to collect local atmospherics and get to know the terrain prior to the fighting season that traditional starts following the poppy harvest. 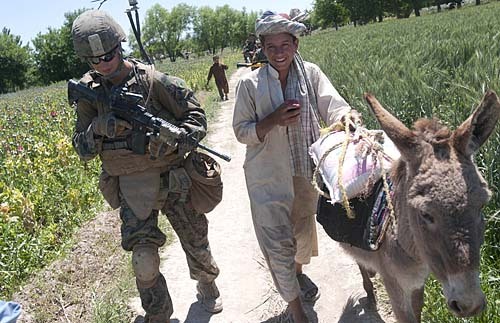 FOB Shamsher in Sangin, Helmand on April 30, 2012.